Many would-be travellers are nervous about the thought of visiting the colossal Latin American titan that is Caracas, and rightly so. This simply enormous capital of Venezuela regularly makes the top-five lists of global destinations plagued by violence and danger. However, that shouldn't necessarily deter you from visiting this exciting, off-the-track city. Caracas is distinctive and modern, with attractive architecture that lends itself well to the deep artistic current running through the society. There's plenty to occupy tourists in the form of museums, parks, malls and nightspots - even if you are just passing through. Foodies and night-owls should head to the eateries and bars around the neighbourhoods of Altamira, El Hatillo, Las Mercedes and Los Palos Grandes. The useful Ministry of Tourism (Ministerio del Turismo - MINTUR) office has enough general tourist information to get you started when you arrive at the Simon Bolivar International Airport, although tourism doesn't really have a toehold in Caracas yet. This means that travellers who want a challenge with their holiday should look no further than this revolutionary location in South America. The giant metropolis of Caracas is spread along a high plateau on the northern side of Venezuela and is separated from the Caribbean Sea by a barrier of mountains. In the city centre, the obligatory Plaza Bolivar so common with Venezuelan cities is central to local life, being dominated by its tall El Libertador statue. Many tourist attractions in downtown Caracas surround the Plaza Bolivar, while for recreational space, both the Central Park (Parque Central) and the East Park (Parque del Este) provide pleasant spots to hang out and relax. Live entertainment is best enjoyed at the Teresa Carreno Cultural Complex (Complejo Cultural Teresa Carreno), and for views, the 360° Roof Bar at the Altamira Suites Hotel is a safe bet, as is a trip on the El Teleferico cable car, which leads to the very top of the El Avila Mountain. 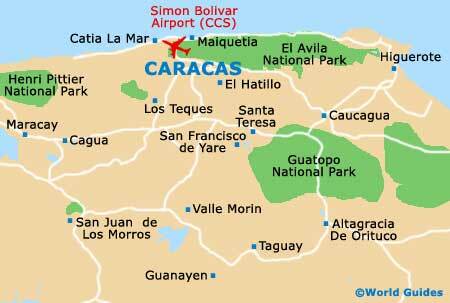 More information about Caracas Tourist Attractions. All around the city, the architecture is a real mish-mash of styles, with high-rise buildings and skyscrapers contrasting with the hillside shantytowns (barrios). One of the city's most prominent landmarks, Caracas Cathedral (Catedral) stands on the leafy Plaza Bolivar and dates back to the middle of the 16th century, although roughly 100 years later, a major earthquake flattened the church and it was subsequently rebuilt and remodelled in the 19th century. Also on the Plaza Bolivar is the Caracas City Hall (Concejo Municipal), with both the National Pantheon of Venezuela (Panteon Nacional) and the National Assembly (Asemblea Nacional) in close proximity to the square and its cathedral. Further religious landmarks include both the Church of St. Francis (Iglesia de San Francisco) on the Avenida Universidad and the Church of the Holy Chapel (Iglesia Santa Capilla) on the Avenida Urdaneta. Home to over 80,000 students, the Central University of Venezuela (Universidad Central de Venezuela) is major part of city life and injects a youthful energy into Caracas. The University Stadium (Estadio Universitario) may well appeal, with its seasonal baseball games and events. Virtually next-door and separated by the Avenida Las Acacias, the UCV Olympic Stadium (Estadio Olimpico de la Universidad Central de Venezuela) offers further sporting events, such as athletics championships, football matches and rugby games, together with the occasional concert thrown in for good measure. More information about Caracas Landmarks and Monuments. Sited around the Parque Central is a cluster of world-class museums, with the Children's Museum (Fundacion Museo de los Ninos) on the Avenida Bolivar providing lots of family fun in the guise of hands-on activities, education and science-related information. Close by, the Museum of Contemporary Art (Museo de Arte Contemporaneo) boasts an astonishing collection of Picasso engravings and paintings by many acclaimed modern artists from around the world. Both the Museum of Fine Arts (Museo de Bellas Artes) and the National Art Gallery (Galeria de Arte Nacional) are further Parque Central magnets, while on the aptly named Plaza de los Museos are museums dedicated to the world of architecture and natural sciences. More information about Caracas Museums and Caracas Art Galleries. Any tourists with a love of nature and the outdoors should consider an excursion to at least one of the surrounding national parks, some of which are regarded as being one-day destinations. These include the Henri Pittier National Park (Parque Nacional Henri Pittier) to the west and the El Avila National Park (Parque Nacional El Avila) to the east, as well as the Guatopo National Park (Parque Nacional Guatopo) to the south-east, the Macarao National Park (Parque Nacional Macarao) to the south-west, the Tacarigua Lagoon National Park (Parque Nacional Laguna de Tacarigua) to the south-east, and the Canaima National Park (Parque Nacional Canaima), to the far south-east. Located just under 90 minutes away and to the south-west is the city of Maracay, a prime candidate for day trips from Caracas, with its lakeside setting next to the Lago de Valencia. Additional popular excursions include the neo-colonial town of El Hatillo, the sandy beaches of Los Roques and the charming town San Francisco de Yare. More information about Caracas Attractions Nearby.